Although it may not feel like it right now, you can overcome grief, and my Handle Grief Hypnosis MP3 is a powerful tool in speeding the healing process. Grief is a natural part of life. If we did not grieve the loss of a loved one to some degree we would not be human. However, when grief becomes so consuming or lasts longer than a year, it can interfere with living and may require some kind of therapy. Hypnosis is one of those therapies used by psychiatrists and clinical hypnotherapists to ease grief. It helps patients to get to the core of why they are unable to let go of grief. It is not intended nor would hypnosis be able to make you forget a person you have loved or lessen their memory or impact in your life. It is intended to make a healthy transition from life with someone to life without them. Grief can also be experienced over the loss of a lifestyle, valued possession, a pet, or difficult change in your life. It is not always the result of a death. In these situations, hypnosis helps you let go of ideals you may have held about the old way and embrace your new circumstances. Change can be difficult but also helps us grow. When changes cause you to grieve for an extended period of time it is counterproductive. In an effort to help people deal with grief, Clinical Hypnotherapist Steve G. Jones developed the Handle Grief Hypnosis MP3 download. In it you will be guided into a relaxed state that opens the mind to a powerful change that helps you embrace good memories and move forward with a new stage of life. Steve G. Jones, Ed.D., Clinical Hypnotherapist, charges $1,500 for a custom recording and $25,000 for a one-hour private hypnotherapy session at his office. But you can get all the benefits for this low price. Simply listen to the Handle Grief Hypnosis MP3 audio every night as you go to bed for three weeks and feel the changes happening in your life. You will feel more empowered, more in touch with your true self, and you will truly know that there is a light at the end of the tunnel. Steve G. Jones achieves AMAZING and LASTING results!!! Hypnosis is the easiest way to affect change in your life because the positive messages go straight to your subconscious mind effortlessly so you can accomplish your goals and reach for the stars!! 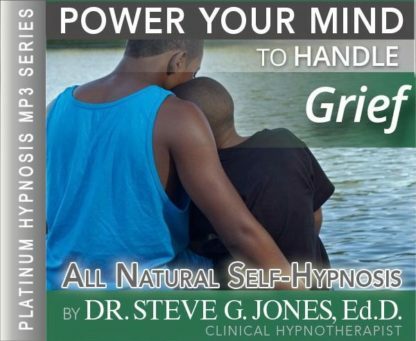 All you have to do is listen to the Handle Grief Hypnosis MP3 download at night as you go to sleep!!! You’ll hear soft music, the gentle sounds of the beach, and the soothing sound of Steve G. Jones’ voice all working together to bring about positive changes in your life easily and naturally. Steve G. Jones has been helping people improve their lives with hypnosis for over 17 years…now it’s time for him to help YOU… don’t wait, do it NOW !!! you’ll be glad you did. See you at the top! Grief is an unfortunate emotion we have all felt at one point in our lives. Whether it is the loss of a loved one, pet, safety, or employment, it is a very difficult emotion to cope with. When grieving, it is important to have a support network to help you go through the difficult time. There is a commonly known “grief cycle” that people often go through after a loss, they are: denial, anger, bargaining, depression, and acceptance. During this time it is important to stay as positive as you can and realize that with time it will get better. Grief can affect you in more than just an emotional way. It can have an impact on you spiritually, physically, socially, and mentally. It is important to seek help in some way in order to cope with your loss. Whether it is the support of a friend or help from a professional, I encourage you to overcome your grief. And as you continue relaxing, you realize just how powerful you are. And you realize that there is a time for grief and you allow yourself to go through that process. You allow yourself to grieve because this is natural and it is helpful to you and when that time has passed you let go of that grief, that’s right. You let go of that grief. I would like you now to imagine yourself lying down in a beautiful field, that’s right. I’d like you to imagine that grief as a very heavy ball sitting on your chest as you lie down in that field. And feel how unnatural it is to have this heavy ball on your chest. The time will soon come when you will lift that heavy ball off your chest all by yourself and push it upward and it will float, float away because all of its energy is gone and it is very light, light like air. When you are ready to let go of grieving you push that ball up and away from you as it floats off into the distance. When you are ready, when the time is right, very soon indeed, you will imagine yourself pushing that ball off of your chest and letting it float away because the grief has served its purpose. And since the grief has served its purpose it can then be lifted up and away from you, leaving your relaxed, at ease, peaceful, ready to go on with your life, ready to pursue your dreams and your goals. And you are so relaxed and peaceful now because you now have the knowledge that very soon indeed, that ball of grief will be lifting off of your chest and moving away from you permanently. And when the time is right, very soon indeed, you will do this easily and effortlessly, letting go of that grief forever. Grief is the resulting emotion of feeling a sense of loss. Loss can be more than the death of a loved one, it can include loss of a pet, job, safety, financial security, or things. Grief is a very strong emotion that you can overcome. Grief can have other symptoms including insomnia, problems with appetite, and shortness of breath. It is important that you seek help to overcome your grief. The Handle Grief Hypnosis MP3 audio will help you reach the end of your grieving process. It is important that you grieve and mourn for your loss, but then it is important for you to move on with your life. Hypnosis will help you discover peace with your loss. This powerful self-hypnosis session will give you the positive affirmations you need. We suggest you listen to this Handle Grief Hypnosis MP3 recording for 21 nights in row before going to bed. With time and hypnosis, you will discover the light at the end of the tunnel. You can achieve inner peace with the overcome grief self-hypnosis recording.